So last time we started talking about what you need to understand about wire, and we started learning the basics. 1. What the wire is made of. 2. How hard the wire is. 3. What gauge the wire is. This week we are talking about understanding the hardness of the wire. Wire is usually sold hard, half hard or dead soft. But what exactly does that mean? Well, basically it means what it says. If the wire is hard, it is stiff and relatively inflexible. Dead soft means that the wire has been thoroughly annealed and is about as soft as the metal that it is made of will allow it to be. And half hard is half-way in between. Some manufacturers will use other terms using fractions, like ¼ hard, or ¾ hard, but these are less common, and rarely found in craft wire. If you feel a need to understand the more complex scientific definitions of wire hardness, in terms of tensile strength and hardness scales, Rio Grande Jewelry has a chart which shows all of the major hardness details. But why does the hardness of the wire matter? Well if the wire is too soft it will not hold its shape, but if it is too hard it may actually break while you are bending or twisting it. Most of the time half-hard wire is a good choice. It will allow you to bend it, but it will harden just enough from bending it that it will hold its shape well. Remember, the process of bending or hammering a wire actually hardens it. If you are doing complex twisting of the wire, as with head pins and wire wrapping, then you probably will want to purchase your wire dead soft. There are few things more frustrating than having a wire break while you are trying to finish the final wrap on a piece. 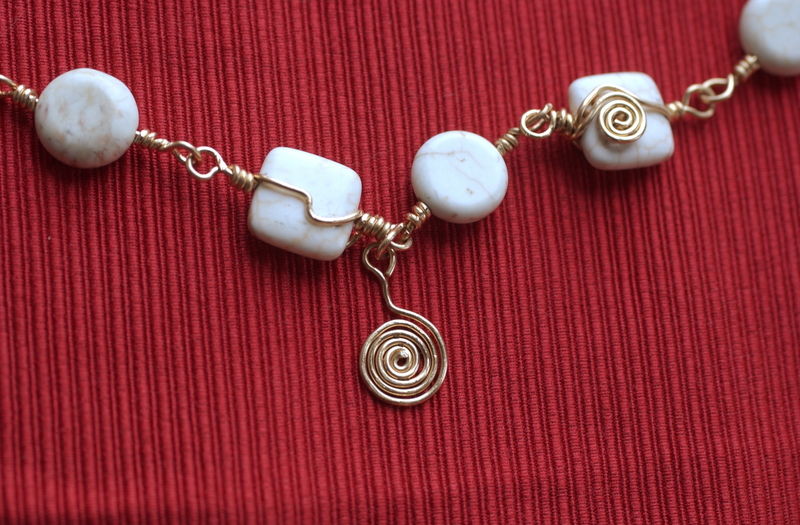 This picture shows a piece of modern jewelry that was wire wrapped. The wire started out dead soft, but because of the extensive twisting and shaping, the final form of the wire is hard. Hard wire is usually used when you want a very stiff wire form, like a pin. Very few craft locations, or even jewelry suppliers sell hard wire, it must normally be purchased from a metal supply house in the form of straight sticks, or created by drawing the wire down and/or hammering it. Another term that you may run across for some metals is spring hard. This indicates metal that has been hardened, usually by a combination of drawing and heat treating until it is actually springy and is VERY difficult to bend. This type of metal must definitely be purchased from a metal supplier in the form of straight sticks. It is usually used in equipment manufacturing. I hope this simple explanation of wire hardness is helpful to you. Choosing the correct wire hardness for a project is important in assuring your success.